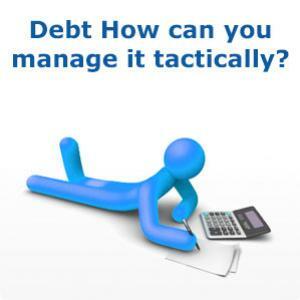 Debt: How can you manage it tactically? However, though good debts can be differentiated from bad debts, yet at the end of the day, you need to repay all your debts. Debt – More often than not, it is looked down upon. However, though good debts can be differentiated from bad debts, yet at the end of the day, you need to repay all your debts. Therefore, you should target each of your debt strategically so that you’re able to pay them off within the stipulated time period. Here are few of the debts, which most of you have, and how you can manage them tactically. Mortgage loan debt: A mortgage loan debt is actually a good debt as usually a property appreciates in value and you can make profit by selling it later at a higher price. However, you should keep certain things in mind while dealing with mortgage debt which are listed below. · Calculate house expense ratio - Your monthly payments on mortgage, including principal and interest along with home insurance and real estate taxes, should not exceed 28% of your gross monthly income. · Refinance if required - If you have taken out a mortgage at a higher interest as compared to the current mortgage rate, then consider refinancing; however, do the necessary calculations to make sure that it makes sense. · Decide between ARM and FRM - Take out an adjustable rate mortgage or an ARM only if you’re confident that you’d be able to make the monthly mortgage payments even if the interest rates rise in future; otherwise, consider obtaining an FRM or a fixed rate mortgage. Credit card debt: This is a type of debt burden from which people struggle to come out. However, you can follow these strategies to manage your credit card debt in a better way. · Leverage payment cycle - If you buy something on the next day after your statement closes, then you get an interest free period of up to 55 days to repay the amount. · Transfer balance to a low rate card - You may consider balance transfer wherein you transfer your high interest credit card debt to a card with a relatively lower rate. Moreover, if you get a promotional card, then the interest rate will be really low for a certain time period within which you can repay your existing debt. · Negotiate with creditors – You can negotiate with your creditors regarding waived fees, lower interest rates and an increase in the credit limit on your card. Car loan debt: At first, decide whether you want to drive a car for some years or you like changing cars. If you can relate yourself more with the second thought, then leasing a car is a better alternative. However, here are certain things you need to know if you want to obtain a car loan in order to buy a car. · Make extra payments towards the principal – if your financial condition permits, opt for bi-weekly payments and specify the extra money should be applied towards reducing the principal amount of the car loan. · Purchase a car insurance policy – It is always better to purchase car insurance coverage so that you are well covered for a wide range of scenarios where financial loss can occur. · Be cautious about add-ons – Think twice before you buy credit insurance, extended warranties and other extra stuff from your car dealer, because all they want to make is money. Student loan debt: Though considered to be a good debt, yet you need to manage it and repay it in time in order to keep your financial life in order. You need to know the following things in order to manage your student debt loan strategically. · Pay your private loans first – You should always pay your private loans first since the interest rates are comparatively higher than that of federal student loans. · Check out your tax deduction – If your income is less than the IRS limit, then you can deduct a certain amount of what you pay in student loan interest. · Gather knowledge about repayment options – You can have some of your student loan debt forgiven or you can be eligible to pay a lesser amount depending on your current income. It can be said that there are certain options to manage your debts tactically. What you have to do is explore the options and choose the one which suits you the best, in order to manage your financial life strategically.